The morning after Julia Ross (Nina Foch, Executive Suite) takes a job in London as secretary to wealthy widow Mrs Williamson Hughes (Dame May Whitty, The Lady Vanishes), she wakes up in a windswept Cornish mansion, having been drugged. Mrs Hughes and her volatile son, Ralph (George Macready, Gilda), attempt to gaslight Julia into believing she is Ralph's wife, Marion. Her belongings have been destroyed, the windows barred and the locals believe that she is mad. Will Julia be able to escape before she falls prey to the Hughes' sinister charade? And what happened to the real Marion Hughes? 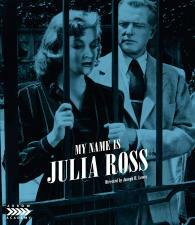 A briskly paced and brilliantly stylised mystery that grabs its audience from the start, My Name Is Julia Ross immediately cemented Lewis' place in the noir pantheon, and anticipated the elaborate identity-based deceptions found in future classic thrillers like Alfred Hitchcock's Vertigo and Brian De Palma's Obsession.